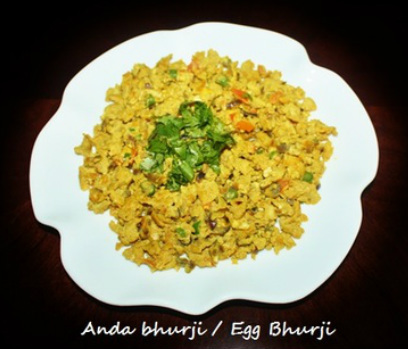 Anda Bhurji (Egg Bhurji) is the most popular Indian dish which is prepared with eggs, onions, tomatoes and other spices. 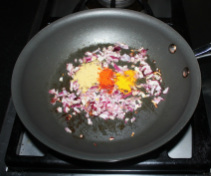 It is kind of scrambled eggs that are cooked with Indian spices instead of just salt and black pepper. 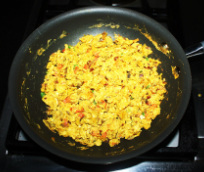 Egg Bhurji is very popular among students in dormitory because it is very easy and fast to make and it keep you full for longer period of time. Egg Bhurji is versatile and there is lot of variations you can make. 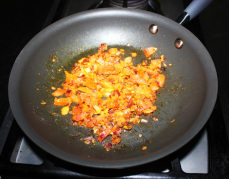 This is a simple recipe but you can add or remove any spices and vegetables. 1. In a bowl break the eggs and whisk it either by spoon or egg beater. Add salt and mix, keep the whisked eggs aside. 2. 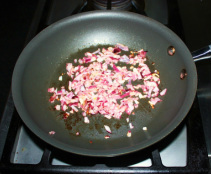 On medium heat add butter (ghee or oil) in a non stick pan. 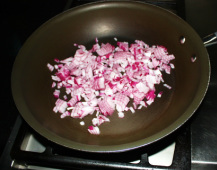 Add chopped onions and sauté for 4 to 5 minutes or until they become translucent. 4. Add chopped tomatoes and cook for 3 to 4 minutes. 5. 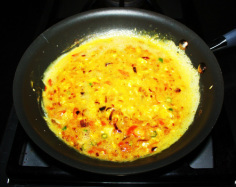 Add whisked eggs and quickly sprinkle chopped green chilies, grated ginger and gram masala and mix. 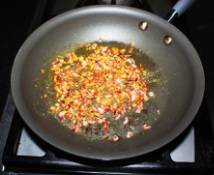 Stir this mixture constantly, with the spatula scrapes the sides and the bottom of the pan this will keeps the eggs from developing a leathery brown skin on the bottom and sides of the pan. 6. 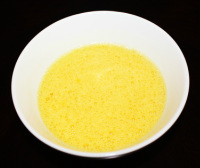 Now the eggs will star cooking and will soon change its texture and color. 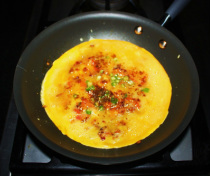 In about 5 to 6 minutes eggs will dry up, keep stirring and keep breaking the eggs lumps, once eggs will turn into small crumbs and you have the desired consistency of eggs turn the stove off and remove the pan from the stove. 7. 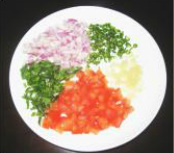 Transfer the egg bhurji in a serving bowl and garnish with chopped coriander leaves. Serve the bhurji hot with parathas. 1. You can add more chilies if you want it spicy. 2. You can add bell peppers (capsicums), potatoes or any other vegetables. 3. Vegetarians can replace eggs with paneer.